Buy Cheap = Buy Twice? Does buying cheaper replacement buoys mean buying twice? Replacing navigation aids because of casualties often involves expenditure that hasn’t been budgeted for. Therefore it is no surprise that, given the choice, many harbour masters and port authorities opt for replacement buoys that come with the cheapest price tag. However, this approach can be a false economy. Cheap plastic buoys don’t have the durability of their premium counterparts and therefore you could find that you end up buying twice; having to replace buoys much sooner than you would have with a premium product. That’s not to say that you should replace steel buoys like-for-like. If legacy steel buoys have come to the end of their useful life, advances in plastic technology means that there are really excellent alternatives now available. Premium plastic buoys such as the Mobilis JET 9000 are made from medium density polyethylene (MDPE), which is durable, light and UV stable making them a more flexible and less expensive option than steel buoys. 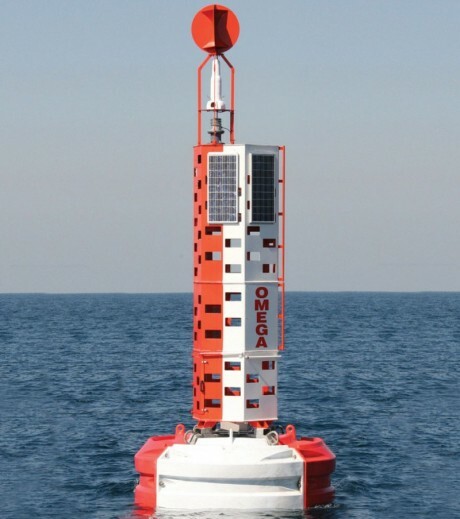 They also have a modular system which means that parts can be easily replaced if they do suffer damage, and therefore this extends the life of this type of buoy. Light – buoys are easy to transport and manoeuvre, reducing the costs of deploying the buoys and maintaining them. Because the buoy is light you can also use lighter (and cheaper) moorings too. No rust – unlike steel, polyethylene does not rust, a key advantage for any product exposed to sea water! No repainting – UV stable polyethylene doesn’t require repainting and therefore the buoy does not need to be lifted and brought on shore for repainting and refurbishment. Easy to clean – buoys can be lifted easily and jet washed at sea, enabling a more effective use of boat time and manpower. You can see how easy this is with just one operator in this video from Mobilis. Less chain wear – lighter buoys equates to less wear and tear on parts and chains. Cost – last, but not least, premium plastic buoys do have a cheaper price tag than a replacement steel buoy, and therefore we recommend that you don’t try to drive prices down further by opting for non-premium products. As highlighted earlier, non-premium buoys may have an attractive purchase price but you could end up spending more long term. A premium buoy, when properly maintained, should not require replacing for at least 20 years (unless it is damaged or lost at sea). As premium buoys are more durable they cope better with adverse conditions than cheaper options and have a higher ability to withstand impacts from boats. Even when damaged, modular systems allow damaged components to be replaced, at sea; no need to replace a cheaper buoy entirely, or bring a steel buoy in for repair. For long term savings buoys should be regularly maintained, thereby extending their useful life and also preventing incidences from occurring. A maintenance programme should include inspecting for damage or wear and tear annually, and after unusual weather events or high volumes of traffic in the area, high pressure jet washing, and repairs where necessary. Deploying a buoy with no maintenance programme in place will shorten its lifespan, affect performance and increases the risk of casualties caused by unreported damage or the stresses of extreme tidal or weather conditions.